Brian William’s false memories of RPG fire in Iraq: Will NBC hold its anchor to the same standard it held Hillary Clinton? The network repeatedly criticized Hillary Clinton for her false memory of “sniper fire.” Will it hold Brian Williams to the same standard? Brian Williams reports from Camp Liberty in Baghdad on March 8, 2007. 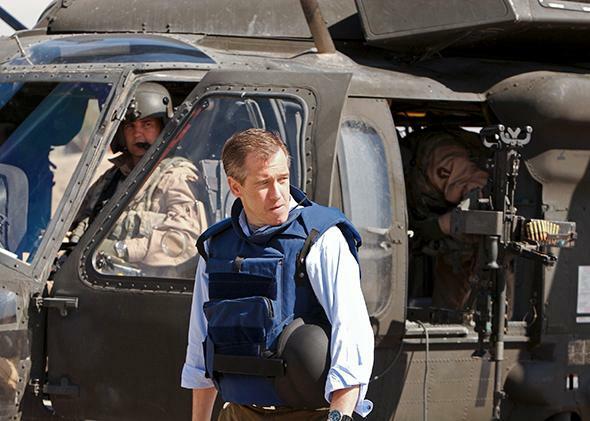 Questions are swirling about NBC Nightly News anchor Brian Williams’ guarded acknowledgment Wednesday night that he had, over the years, falsely claimed to have been in a helicopter that came under rocket-propelled grenade fire in Iraq in 2003. But NBC itself has been mostly mum about the matter, and MSNBC has given it only the briefest of mentions. Tim Russert: Yesterday in the column called “Fact Checker” by Michael Dobbs in the Washington Post, Dobbs wrote this, “Clinton’s tale of landing at the Tuzla Airport under sniper fire and then running for cover is simply not credible. Photographs and video of the arrival ceremony combined with contemporaneous news reports tell a very different story. Four Pinocchios,” which is the highest you can get, which means a whopper in terms of exaggeration. … It’s a credibility issue, truth-telling—is this a problem for Sen. Clinton? Chuck Todd: Well, it’s been the nagging things about this whole campaign. When you ask that question of honest and trustworthy, she has always consistently scored lower than Obama. … But, I, for the life of me, haven’t understood why they have pushed this story. They knew that somebody went after and re-interviewed Sinbad, who was on that trip, the former “comedian,” and I put comedian in quotes. That he was on that trip and doesn’t remember it being that harried or anything like that, and yet she went out and retold the story. … They didn’t need to retell the story because if they had not, then they wouldn’t have gotten this four Pinocchio thing out of the Washington Post and given the Obama campaign something to hit them with. Matt Lauer: So let’s talk about this trip to Bosnia March of 1996. Here’s how Hillary Clinton described it last week: “I remember landing under sniper fire. There was supposed to be some kind of a greeting ceremony at the airport, but instead we just ran with our heads down to get into the vehicles and get to our base.” Now, I still remember winning a Little League championship single-handedly when I was 10, probably didn’t happen. But this isn’t the Little League, this is someone running for president. There were reporters on this trip and she’s using her experience as a deciding factor. How could this happen? Chuck Todd: Well, and it’s worse than that, Matt. There had been reporters questioning her story on this a few weeks ago. One even reached out to the comedian Sinbad, who was also on this trip, to get his recollection of it and it differed from the first lady. So somebody didn’t scrub that speech. It was in prepared remarks last week, and not only did she say it with certitude, but it was in her prepared text. So this was a real sort of bone-headed mistake on the campaign’s part at a time when everybody is looking at everything so carefully. Lauer: Right, and does it make people now go back and start to question everything she said? Keith Olbermann: Forgetting about Bosnia. The March 17 misspeak was just she said, sleep deprivation or something. But now, two other Bosnia misspeaks have turned up. Were they sleep deprivation, too? Speaking of Bosnia, it turns out Sen. Clinton was speaking of Bosnia and gunfire and danger last December. Is that sleep deprivation chronic? Chris Matthews: That said, [for Obama to run ads about] Tuzla doesn’t require any nastiness toward Sen. Clinton. It requires playing over and over again a fish story that she was under enemy fire, a very elaborate kind of story about wartime and risk and courage and survival that turned out not to be at all true. Who would hold that against Barack? I can imagine Mark Penn running series of ads over and over again. I can imagine a saturation campaign. Why doesn’t he do what Hillary would do? A young soldier, who is, like me, from the Jersey Shore, reads my blog entry last week during a break while on active duty in Iraq. The last time I saw him, I was with my friend and NBC News Military Analyst Wayne Downing, a retired 4-Star Army General. Wayne and I were riding along as part of an Army mission to deliver bridge components to the Euphrates River, so that the invading forces of the 3rd Infantry could cross the river on their way to Bagdhad. We came under fire by what appeared to be Iraqi farmers with RPG’s and AK-47’s. The Chinook helicopter flying in front of ours (from the 101st Airborne) took an RPG to the rear rotor, as all four of our low-flying Chinooks took fire. We were forced down and stayed down—for the better (or worse) part of 3 days and 2 nights. Williams had seen what happened to Clinton just weeks earlier, yet kept telling his own fish tale. To paraphrase one of his own NBC colleagues, this isn’t Little League, it’s a nightly news anchor with an audience of millions. Will he be held to the same standards to which NBC and the rest of the media held Clinton?